I could either search the four corners of the Earth seeking this liquid (it was the sole beige amongst the lightest Feria shades), or I could switch to something else, so I got Preference Mega-Blondes instead. This involved a different developer and proportions, so I also picked up an inexpensive plastic bottle with the pointy cap, and half-ounce markings on the side. It's what I'm doing right now! Please keep your fingers crossed for me. The only time I ever switched formulas mid-roots was when I went from Preference to Feria to begin with, and Feria does have a reputation for being difficult to color over. Since I'm just doing the roots, in theory it should work. This is amazing, it won't publish. That's too bad. I hate it when companies discontinue stand-bys. Maybe it is a sign to explore a new color? Far be it from me to divert anyone from a signature hairstyle, as I've been wearing the same bangs for years, but might as well take a fortuitous turn to cosmetic disasters, I dare say. 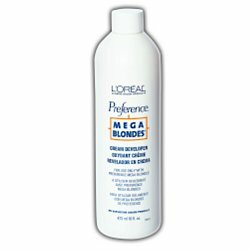 I tried out the Mega Blondes today...I had it in my hair when I was writing the post. :) It seems to have come out well. The thing is to see how long the color lasts. 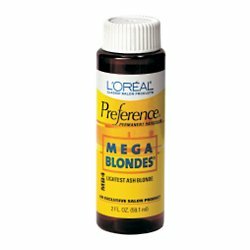 Feria lasted better on me than Preference, but then I never tried Mega Blondes, and it's been years since I used Preference anyway. It could have been reformulated. I think with L'Oreal, they almost always replace whatever they "discontinue" with something very similar. It gives you less reason to switch brands even though you have to go through the aggravation. But if they keep this up, I'm thinking of trying Wella instead. I've read on various boards they have superior haircolor, particular for red.